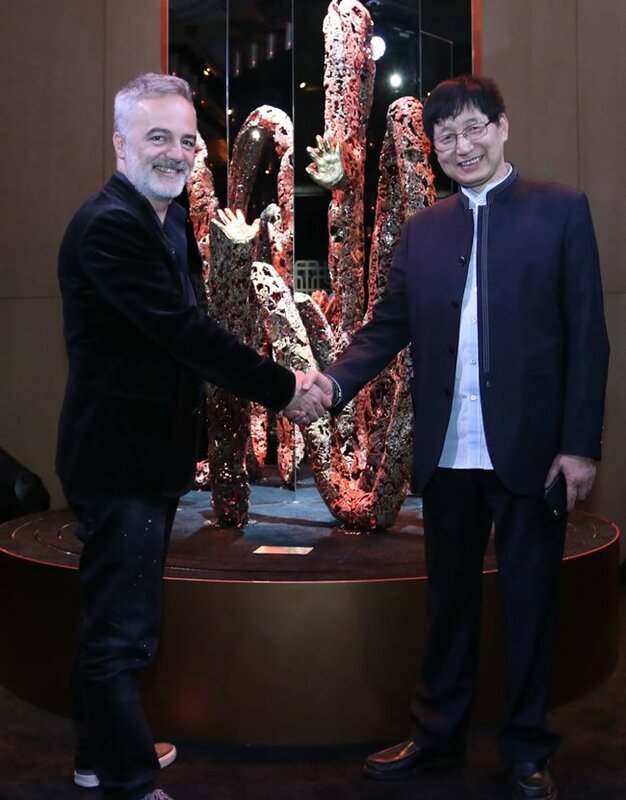 The two-meter-tall work of art, named “The Power of Hands”, showcases the joint creativity of Mr. Claudio Colucci, renowned designer from Switzerland, and Mr. Zhu Bingren, the great master of bronze craft from China. The two artists were brought together in this unique collaboration by Museum of Art & History, Geneva and Manufacture Vacheron Constantin, which has consistently enhanced the beauty of watchmaking creations through artistic crafts throughout its 260 years of uninterrupted history. The bronze sculpture depicts two hands in movement and captures the gesture of crafting. It praises the hand power in transforming a material into beautiful objects. The “two hands” also symbolize a tribute to the 65th anniversary of the bilateral relations between Switzerland and the People’s Republic of China. The unveiling ceremony of the bronze sculpture took place during the opening event of “Geneva at the Heart of Time – The Origin of Swiss Watchmaking Culture” exhibition, where artistic craft is also one of the key highlights. The process of creating “The Power of Hands” took close to one year to complete. Based on Mr. Colucci’s design, Mr. Zhu Bingren realized the tribute to craft by casting melting bronze with coloring process using heptyl. 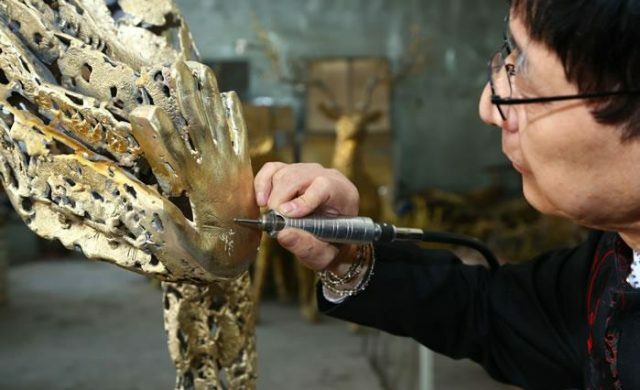 The two hands that the bronze sculpture depicts also bear the palm prints of the two artists, representing artists’ resolution of passing on craftsmen’s skills and know-how, and also of weaving through the Swiss and Chinese cultures and values. “Vacheron Constantin is very proud to have brought together these two exceptional artists from Switzerland and China who not only understand the importance of craft in art and in culture but also put great significance of passing on the skills and know-how into their own careers and works,” said Mr. Juan-Carlos Torres, CEO of Vacheron Constantin. “Mr. Zhu Bingren, as the fourth generation of the bronze craftsman in his family, with his own son being the fifth, in particular resonates with what Vacheron Constantin has treasured since its founding in 1755 – the passing on of traditions and know-how.” This tradition, perpetuated by Vacheron Constantin since its founding in 1755, gives rise to authentic works of art representing exceptional combinations of artistic crafts, from the movement all the way through to the dial. Above and beyond the technical prowess they enshrine, these creations celebrate an artistic vision of time and tell of stories inspired by arts and cultures from around the world. Pioneer in the spirit of Haute Horlogerie, Vacheron Constantin, the world’s oldest watch manufacture since 1755, has a long-standing heritage in art and culture with a strong dedication to excellence and commitment to artistic creativity. The corporate philosophy of the company has been that by sharing and passing on knowledge and know-how, a collective pool of expertise and experience will be created to perfect for the best. This philosophy is demonstrated by Vacheron Constantin’s numerous art and culture partnership programs and the masterpieces that the Manufacture Vacheron Constantin creates. The Master Artisans of the Manufacture are artists by nature, endowed with the unique gift of creating emotions. Passed on from generation to generation, from Master to apprentice, their expertise has shaped a collective memory. Opened in October 1910 in the old city, Museum of Art & History, Geneva, is one of the biggest pluridisciplinary museums of Switzerland. While the building was designed by Marc Camoletti an architect son of the city, whose architecture is typical for the “Beaux-Arts style” en vogue at the time in France, its collections largely date back to the musée Rath, one of the first art museums in Europe, which opened 1826. However, the aim of the “Grand musée” of 1910 was to reunite the city’s collections of applied art, archeology and fine arts within one institution. Since before, horology and enamels were famous around Europe as one of the most important and interesting public collection. Separated in view to be presented in a thematic museum known as Musée de l’horlogerie et de l’émaillerie de Genève (1972-2002), the impressive collections of clocks and watches, enamels, jewels and miniatures, join back the main building in 2010. With masterpieces, precious various objects and also studies items created both by the outstanding local industry and by abroad artists, the Geneva’s collection of horology proposes a look at the trades and art crafts practised in the Geneva Fabrique (manufactory) especially between 17th and 19th century. In a region which saw the historical birth of watchmaking, it allows to understand horology in an international context that testifies to the art of timekeeping that was developed in Europe from the 16th to the 21st century. Although Geneva is at the heart of the collections, the works are placed in an international context that testifies to the art of timekeeping that was developed in Europe from the 16th to the 20th century, and of which the Museum’s collection provides an abundant and high-quality reflection. From the cabinotier himself to the atelier he toiled in, viewers can follow the evolution of Geneva’s watchmakers, engravers, rose engine turners, chasers and enamellers; they can admire the enamelled watches and jewels that were the Fabrique’s speciality, appreciate the timepieces decorated in the Oriental style, contemplate miniature masterpieces, and understand the close ties maintained between the Fabrique artisans and the renowned portraitists that were honoured in the courts of Europe. The world of the Fabrique is not just evoked or reconstituted: it lives on, in a space where the watchmaker’s workbench, the jeweller’s atelier and the enameller’s abandoned paintbrush belong to Geneva’s collective memory. Museum of Art & History, Geneva, shall temporarily close its doors at the end of 2015, as it plans a vast renovation and extension of its historical building, under the direction of the famous French architect Jean Nouvel, in order to fit the expectations of the visitors of the 21st century. Founded in Geneva in 1755, Vacheron Constantin is the world’s oldest watch manufacturer engaged in uninterrupted activity for 260 years. Founders of the very spirit of the technical and precious Fine Watchmaking, the men and women of Vacheron Constantin continue to design, develop and produce exceptional timepieces true to the brand’s three fundaments: perfectly mastered techniques, inspired and harmonious aesthetics, and an extremely high level of finishing. Pursuing its longstanding ties with the world of art and culture, Vacheron Constantin is committed to fostering Artistic Crafts that play such a key role in contemporary creativity, while highlighting the excellence achieved by combining these talents with those of Design. Its support to the vibrant life force of creativity is notably illustrated through fostering the international influence and ensuring the longevity of the artistic crafts, which could indeed not survive without this determination to promote their transmission. A transmission that is exercised on a daily basis within the Manufacture, notably between master-watchmaker and apprentice, thereby perpetuating the tradition of sharing cultivated within the Maison for the past generations. The Vacheron Constantin’s Heritage Collection is evidence of the age-old Geneva watchmaking history through the prism of the world’s oldest watch manufacturer uninterrupted history for 260 years since it was founded in Geneva in 1755. Regrouping over 3,000 objects including 1,300 timepieces, 700 antique tooling as well as antique workshop furniture and paintings. Preciously guarded in Geneva the collection of timepieces was little by little compiled following many requests made to Vacheron Constantin to represent Geneva and Swiss watchmaking savoir-faire during Universal, International and National exhibitions that took place during the second half of the 19th century. Finally after the 1906 Milan National Exhibition, Vacheron Constantin decided to formally create its Heritage Collection. Pieces of the Vacheron Heritage Collection were exhibited in various museums around the world among which the MUDAC in Lausanne, Switzerland, the Art & History Museum of Geneva, Switzerland, and the Singapore National Museum just to name a few. The Vacheron Constantin Heritage Collection shows the historical evolution of both the technological, aesthetical and craftsmanship aspect of Genevan Haute Horlogerie. Founders of the very spirit of the technical and precious Fine Watchmaking, the men and women of Vacheron Constantin continue to design, develop and produce exceptional timepieces true to the Maison’s three fundaments: perfectly mastered techniques, inspired and harmonious aesthetics, and an extremely high level of finishing. Born in 1965 in Locarno to an Austrian mother and an Italian father, Claudio Colucci has made mixing and movement characteristics of his work. “Travel, the interaction of movement has made me a partner of the in-between, an author of transition from one thing to another, from one world to another”, he acknowledged between flights. A minimal, dynamic and colorful style is at the root of his work, the outcome of his initial training in graphic design where he tended towards a polymorphous and global design. It is a real style that vibrates with interacting influences. Today as a designer, scenographer, interior architect Claudio is an excellent all-rounder.